JSHS gives high school students an opportunity to showcase their original STEM research. 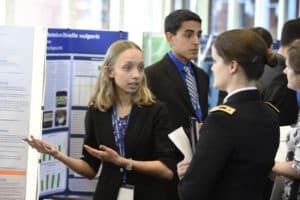 You will also learn from other students’ research and meet STEM professionals from academia, industry, and the Department of Defense. While gaining valuable experience and sharpening your presentation skills, you will also compete for undergraduate scholarships sponsored by the U.S. Army, Navy, and Air Force. All JSHS students start with their local regional competition. Find your region here and pay close attention to the application process, deadlines, and requirements for participation — note that some offer participation for non-competing students too! Each region follows the standards set forth in our Rules of Competition. This outlines the abstract, paper, and presentation process too. Contact your JSHS Regional staff with questions about the application process and introduce yourself!